Simply place a few red hot candies on this star wreath and you have easy Christmas cupcakes! What You Need: 1 cupcake (baked and cooled); white frosting; green frosting; pastry bag and metal star tip or prepared tube and plastic tip; red hot (cinnamon imperial) candies. How to Make It: Frost cupcake white. Tint some icing green using liquid or paste food coloring and fill pasty bag half-full and assemble coupler and #16 or #21 star tip. (You could instead buy green frosting in a tube; and the star tip is usually one in a set of four that screw right on to the tube.) Make a circle of stars, being careful to stop squeezing before you pull away or your stars will have points on their tops. Add red hot candies for berries. 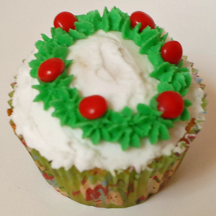 This entry was posted on Thursday, December 6th, 2007 at 4:00 am	and is filed under Christmas cupcakes. You can follow any responses to this entry through the RSS 2.0 feed. Responses are currently closed, but you can trackback from your own site.